Having a swimming pool is one of the greatest assets you can add to your home. It can bring a great deal of family entertainment. When looked after properly it can mean very little maintenance or cost for its upkeep. The best way of doing this is to utilize a swimming pool service provider. 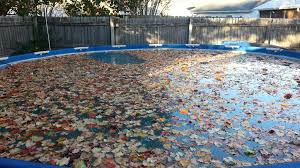 One of the biggest problems that you can end up having to deal with is falling leaves into the pool. These can end up damaging your pool equipment. When this happens then you have got to rely on pool repair professionals to help you deal with it. The best step to take of course is preventative measures. This starts at the very beginning when you are planning for the install of your pool. With some careful planning, you should be able to find a location for your pool where it is not going to be underneath trees that are going to create a problem for you. You want to remove any leaves that you notice have gone into the pool as soon as possible. Don’t just leave them there until you are ready to do your pool maintenance. After a short time, they will end up floating to the bottom of the pool. Eventually, they will end up being drawn into the filtering system where they could cause some damage. Be sure to make use of regular pool services to keep your pool in prime condition at all times. There is nothing worse than heading out to the pool for a great swim only to discover that the water appears to be cloudy or even worse is turning green. The culprit for this could very well be the leaves that are in the pool that have gone unnoticed. If you utilize quality care pool services then you are not going to have to deal with this type of problem. You can easily hire pool maintenance services that are affordable. Not only that they are surely going to save you pool repair costs by staying on top of not only keeping the pool clean, but treating it appropriately with the right chemicals. You want to hire a swimming pool service to do your pool maintenance for you that you know is trustworthy and reliable. That way if you need to be away from home for a few days you never have to worry about what condition your pool will be in when you get home.